Combustible dust hazards are a fact of life for many production and processing industries and dust collection is one of the easiest ways to prevent hazardous dusts from exploding or igniting. Unfortunately, dust collection systems do require updates as standards and technologies change, and as the output or requirements inside of the facility change. Dust collection is essential to managing combustible dust levels to prevent explosions, and in this article, you will learn how to use your DHA to ensure that your dust system is up to date and capable of protecting your system. It is important to consider that your dust collection system is a hazard in itself. Dust collectors specifically create large collections of dust that they trap from the air and from other areas, which are then stored in single locations. In fact, about 40 percent of combustible dust explosions over the last 25 years have involved dust collectors. For that reason, dust collection system inspections are now required by OSHA's National Emphasis Program as part of the NFPA standard 652 and 654. These standards require you to perform a dust hazard analysis (DHA) before September/October 2018, and that you perform a yearly analysis of your dust collection system. You can use standards to calculate the amount of explosion vent area required for your dust collection system. 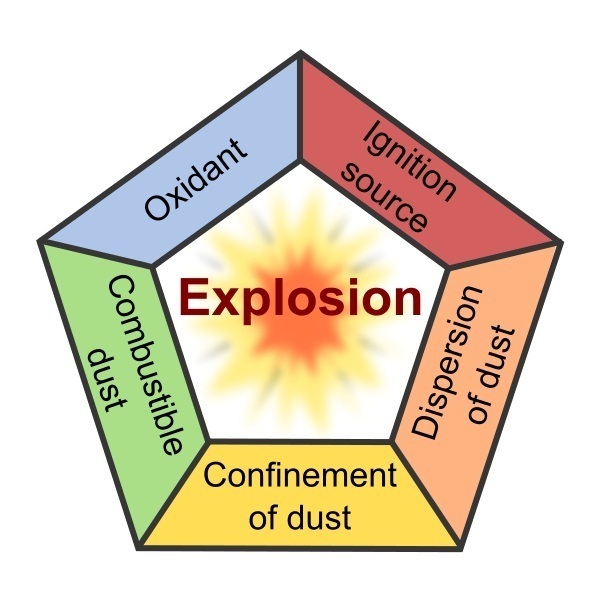 You should receive enough information in your dust analysis to tell you whether or not your dust is explosive or flammable, if so, to what extent. The higher the Kst value, the more explosive the dust. If you have an ST 1-3 dust, then you need explosion venting. Your explosion venting has to match or exceed the KST value for your dust. In most cases, dusts in explosion class ST 3 must have special explosion venting designed for the specific unit to accommodate specific pressure and stresses based on the system design. Dusts with a Kst value of 600 or higher can only be collected using a wet dust collector. This exhaust system must include a dust collection system. The dust collection system must be sealed so that dust does not leak out of the system during storage or when the system is shut down. The dust collection system must be capable of maintaining combustible dust concentrations under the minimum explosible concentration (MEC), or the concentration at which dust in the air becomes a hazard. If your facility handles any sort of combustible dust, your OSHA inspector will ask whether the conveying air velocity through your dust collection system is adequate for your needs. They will also ask for the relevant documentation of this, which you should have created during your DHA. It is important to identify the minimum air velocity required and then maintain an air velocity volume over that. Why? If the air velocity volume is too low, dust can drop out and build up inside of the ducts to create explosion hazards. If it is to high, the system will waste energy, cause wear and tear on the duct, and may cause sticky or wet dusts to smear on the duct walls. For most systems, a conveying air velocity of 3,500-4,00 fpm (17.5-20m/s) is a reasonable starting point but you may have to go up or down depending on the weight and volume of your dust. Check the Industrial Ventilation: A Manual of Recommended Practice for Design for more information on air velocity speeds for different dusts in different dust collection systems. Duct work should also be constructed of small sections that can be easily taken apart to remove blockages and buildup as-is needed. Isolation Devices – Explosion and flame front isolation devices are required to prevent flames or explosions from spreading between different parts of a dust collections system. Isolation flap valves and flame front isolation devices are two common methods for achieving this. Blast Gates – Blast gates should be installed to allow for air flow adjustments to balance airflow in individual duct branches. This is crucial to ensure that the air velocity flow remains even throughout the system. It is also crucial to set the correct position for the blast gates. System monitoring is crucial to preventing issues, recognizing problems in the system, and fixing problems as they occur. You will be required to collect baseline performance data to show that your dust collection system can perform to deliver the desired airflow at every opening or hood to ensure equal pressure across the system and safety in the system. This data also allows you to perform long-term system monitoring, because you can easily tell when or if performance drops below the baseline. The NFP Standard 652, 654, and the older NFPA standard 69 all regulate the requirements for your dust collection system. If it is not up to date, then your system is an explosion or fire hazard. Performing a Dust Hazard Analysis and regular inspections of your system will help to ensure that your system is capable of collecting dust at the volume required by your facility and that it can safely mitigate the risks of an explosion inside of the collector.